We haven’t given a con report on anything we’ve done recently, so we’re doing a super big con report for this year. Cons visited this years include: Karoshi Con, Anime Central, the Hammond Art Tour, Elmhurst Public Library Comic Show, OPPL Con and Ramencon. What a schedule! Karoshi was fun as always and was a good start to the year, even though we forgot a part of our display. It was Jhim43’s birthday that day and Min brought mint meltaway cupcakes. 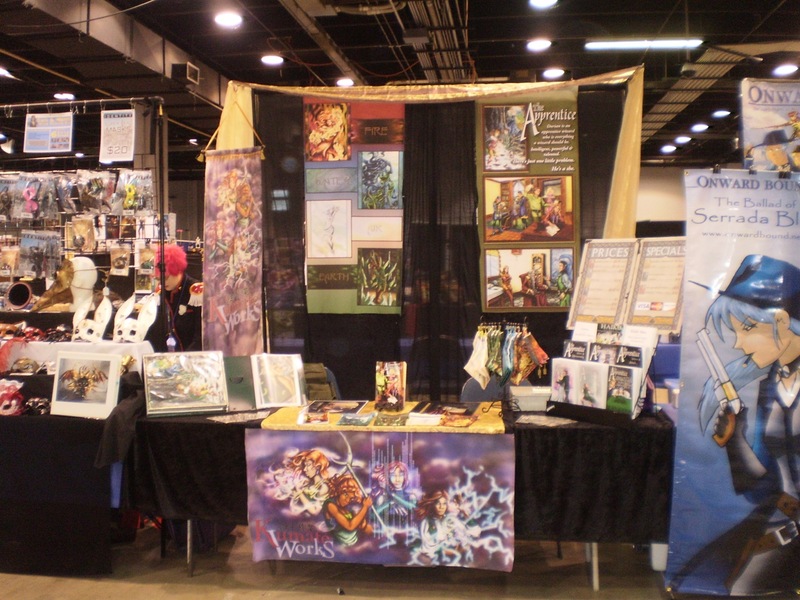 Our friend Sara was exhibiting there for her first convention experience and made a big splash. Congratulations Sara! Anime Central came and went in its usual flurry of activity. We debuted Apprentice Issue 10, marking the halfway point in the series. Thank you to Jhim43 for doing a fabulous job as last minute replacement artist. Min didn’t join us this year, but our friend Bon did his usual fantastic job as gopher to Fuu and Ishi. Apparently we ended up on someone’s written shopping list and she and our other regulars made a point of visiting us on Friday for the new issues. The Hammond Art Tour was a small free show run in one of Fuu’s day job buildings. As usual, it was quiet but it’s always nice to talk to local people. And how can you say no to a free show that’s five minutes from your house, especially when they give you lunch? The next show we did was at the Elmhurst Public Library. We got a fair amount of traffic consisting of mostly browsers. We got to sit next to our good friends Addie and Jhim43. Then DC and Stephanie with Panda Rage Press stopped by with their brand new baby. New mascot for everyone! A few weeks afterwards found us in Orland at OPPL Con. Lots of fun cosplayers there and an interesting fellow who wanted us to use his accounting skills. We didn’t have the heart to tell him that there is no payroll. There were also some great networking opportunities and the con provided a tasty free lunch. Which brings us to Ramencon, the final Ramencon at the Radison Star Plaza. We will really miss the awesome hotel staff there as they always deck out in thier nerd apparel just for us. We had a new Ramencon fan who brought her books by for signing, in their original bag and later stopped by to introduce her mom to us. Shout out to Elizabeth! We got to hang with our friends Nick and Molly Kazfey with Rubberpunk Studios. Ramencon saw the debut of Apprentice 11 illustrated by Sara. This brings us ready to produce our third collected volume of The Apprentice! Now we’re preparing to batten down the hatches for Nanowrimo and the next Apprentice volume. Apprentice 12 will be a special bonus for the collected volume. No Inktober this year-big software rollout at Alysia’s day job. We’ve started planning next years shows, calendar will be going up soon. Thanks for a good convention year, folks and we’ll see you all in the spring! Previous Post Back in action at Animecentral!